Chausiku Ramadhan is 12 years old girl, lives in Mwembemkole street in Bagamoyo district within Coastal region, Tanzania. She is a deafblind from birth, born first among four children in the family. The name of the father is Ramadhani Mohamed(37)years, he is a fisherman and the name of mother is Tukae Jumbe (36). The mother is a house wife but she has a food kiosk at the place she live rented two rooms. Although there was a normal delivery but she was not able to open eyes. Her parents sent Chausiku to local medication and hospital during struggling for her vision and hearing abilities. Unfortunately, lucky was not on her side. According to her mother, the cause of Chausiku’s condition is unknown. Chausiku,a congenitally deafblind in the Community Based Rehabilitation CBR programme under support of Sense International (T) was among the 12 deaf blind children identified in Bagamoyo district for the year 2011. The deafblind children are more at risk environment. When TRACED identified Chausiku at first she could not manage to walk, seat alone in a good posture, feed (eat) herself, and had a sleepless at nights. That is she could not have a daily living (ADL) skills. This was a big challenge to Chausiku Ramadhani. Chausiku is now able to sleep at night because of keeping her tired during the day hours…’’remarks her mother with joy. Chausiku’s parents are seeing their role in establishing the child’s independence in the home environment for the day when the child is expected for schooling. Her mother alongside with TRACED- Community Based Rehabilitation Worker (CBW) is now struggling to teach function skills (ADL) that would also be useful in the home and school environment under inclusive approach introduced by FRORA Inclusive Day Care Centre. In order to ensure that Chausiku is being rehabilitation under the inclusive approach this early year the family was advice by TRACED that the two brothers (who are twins) to be enrolled at FRORA Inclusive Day Care Centre. · During rainy season it is not possible to attend because at present Chausiku and her two brother are being ferry by two motorcycles provided by Erikshjalpen in 2011. 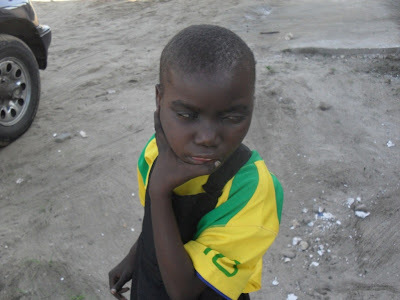 · Stigmatization of some people in Bagamoyo towards disabled children in the community, this is even worse to the case of Chausiku Ramadhan who is a deafblind Child. When there is no any family member to accompany the team of Chausiku and her two twins brothers – Hussein and Hassan, that mean they will not attend to the centre.